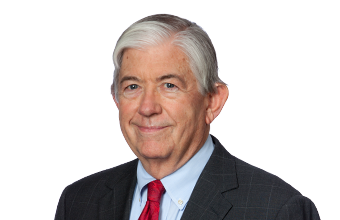 McAfee & Taft is pleased to congratulate Carl Edwards, civic leader and co-founder of Price, Edwards & Co., on being honored as the 2013 recipient of the Dean A. McGee Award for his contributions to downtown Oklahoma City. The firm’s very own Frank Hill presented Edwards with the prestigious award at the black-tie event held sponsored by Downtown Oklahoma City Inc. on May 30th at the Skirvin Hilton Hotel. The award is named after Dean A. McGee, the renowned Oklahoma City business leader who served as chairman of Kerr-McGee Corp. for two decades and who was passionate about developing downtown for future generations. 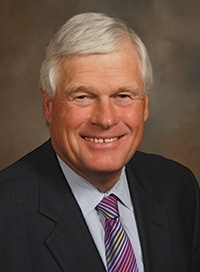 In addition to being credited as one of the pioneers in developing downtown’s Presbyterian Health Foundation Research Park, Edwards has served in leadership positions with numerous business and civic boards for downtown organizations, including chairman of the board of trustees of Presbyterian Health Foundation, chairman of the Oklahoma Metropolitan Area Public Schools Trust, past chairman of the Oklahoma Bioscience Association, past chairman of the Oklahoma Health Center Foundation board, and past chairman of the Greater Oklahoma City Chamber of Commerce.